Feel free to caption this photo. The Romance of Tristan and Iseult, retold by Joseph Bèdier is the only book I finished, last week, and that gets me to a grand total of 5 books read in November. Eeks. What a terrible month. But, again, I loved what I read and I'd rather read and love 5 books than finish a dozen bad ones, so I'll try not to focus on the number. And, I want to start about 5,000 other books. I'm strongly considering a private day or two of reading till my head explodes. Seems reasonable, right? This will be a quick-dash malarkey using the old format. Busy day! Orphan Train by Christina Baker Kline (a reread for F2F discussion) - Not sure if I'll write about this, since I read the book as an ARC and reviewed it then, but I will say everyone in the group enjoyed it and the discussion was much more interesting than I'd anticipated. We were also very, very happy to finally discuss a book that ended on a happy note after several months of downers. A Boy Called Christmas by Matt Haig - I wanted to buy a copy of Matt Haig's latest as soon as I heard about it, but it was not available for pre-order in the U.S. So, I pre-ordered a copy from Book Depository. The Guardian's reviewer called it an instant Christmas classic. I liked the balance of dark and light, the way this book explains certain things about Santa or Father Christmas that others have not, and a few very quotable passages, in particular. I think I might have to reread it before Christmas. It's a quick, fun read. Sherlock Chronicles by Steve Tribe - Just finished reading about the third episode from the first season, so I'll be watching that episode, tonight. I Love it When You Talk Retro by Ralph Keyes - I had this book set aside to read and my husband tried to murder it with a cup of coffee (spilled - it's a mostly brown book, now, with very wavy pages). The pages aren't stuck together, though, so I figured I should go ahead and read it then probably recycle. I suspect people would be wary of that brown all over the pages and avoid it if I donated it. The Sparrow Sisters by Ellen Herrick - Not very far into this and at this point it's not grabbing me, so I've got my fingers crossed that I'll fall in love, soon. I have a mere 3,508 words to go but Kiddo just got a job offer about an hour ago and he's so wired that I had to stop typing to let him chatter at me. My goal is to finish tonight so that I can move on to working on another story after Thanksgiving. Fingers crossed. I'll be taking off a few days for Thanksgiving, as I usually do. Not sure when. If I can squeeze a couple of reviews in first, I will. It mostly depends upon whether or not I finish my NaNo book, today. If I don't manage to finish before I take time off, Happy Thanksgiving to my American friends! First, she removed Escape from Sobibor from the shelf. Then, after I put it back, she played with the ribbon on a bookmark in The Guernsey Literary and Potato Peel Pie Society. After that, she pushed back some books, tried to remove Escape from Sobibor, again, and stuck her face between the books to peer into the space behind. Sometimes Isabel can be a little bit naughty but even when she's being a pain, she's such fun. You'd think I would have written about Neverwhere, by now, wouldn't you? It's been a month since I finished the book. The Read-along turned out to be more of a buddy read with just 3 or 4 of us reading and only two of us chatting about it, but that was fine. I really enjoyed discussing Neverwhere with Florinda (link leads to Florinda's review of the audio). Richard Mayhew is an "every man" type character who ignores his girlfriend's insistence to ignore a tattered, bleeding girl they discover lying in the street. Instead, he takes her home and opens up a path to London's dark, magical and mysterious underground world known as London Below. 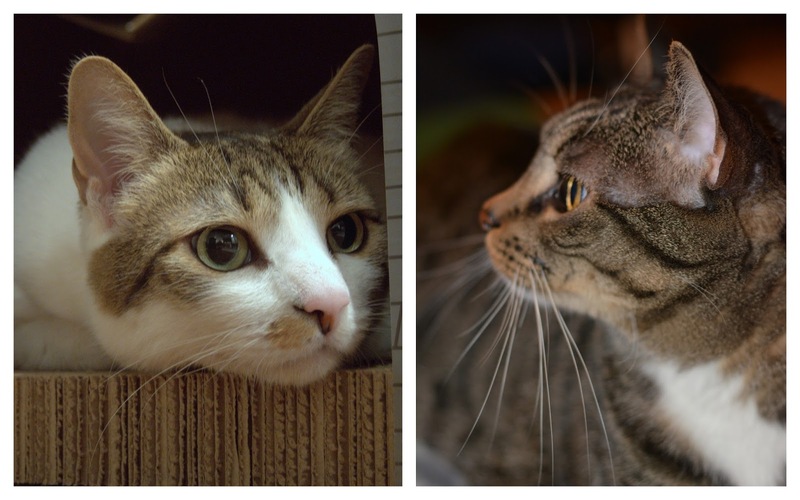 The girl Richard has rescued is named Door and her name is apt; she has a special ability to open doors. Door is on a mission to find out who killed her family and Richard is swept along into the dark world that lies within London's Underground and its sewers. Once you enter London Below, you become invisible in the world above. Richard can't go home. Door begins her search with the Marquis de Carabas and then another character with an obvious name, Hunter. The Marquis owes her a favor and the Hunter will serve as her protection as she attempts to solve the mystery. But, Neil Gaiman likes strong heroines and Door is pretty tough on her own. Richard initially tags along because he has no choice in the matter but eventually he finds his own strength. There are two extraordinarily creepy characters known as Mr. Vandemar and Mr. Croup who will turn your stomach, an angel in the British Museum, and all sorts of wonderful London references. I began reading Neverwhere on the plane to London and decided to stretch out the reading for a while after we returned. It was particularly fun to open the book at night and see a reference to some place I'd just been and, of course, I would have loved the book for its London references even if I hadn't been there at the time. Neverwhere is a unique, intriguing, bizarre, sometimes humorous adventure. I was riveted. Highly recommended - An immensely entertaining adventure in which the darkness and mystery of an underground fantasy world and the characters inhabiting it intersect with the sometimes-frustrating and often goofy, slapstick world of the human cast into its depths. Neverwhere is now up there with my other favorite by Gaiman, Stardust. I've mentioned that I purchased the radio performance so an update on that . . . nope, I haven't listened. I began to listen to it but I have no commute and sitting still to listen on the computer would just be crazy. So, I'm going to either try to load it to my iPad for the next time I travel or pop the CDs into the CD player (yep, I still have one of those in my vehicle) the next time I take a road trip of any kind. Till then . . . I did listen to a tiny bit and I agree with Florinda that it's best if you read the book or listen to the full audiobook, first. Humans of New York: Stories is a collection of photos and quotes or stories (some a single line, some a series of several photos and paragraphs) that are posted daily on the Humans of New York Facebook page. Some I recognized from that page but I've only recently begun following so most of the photos and their associated stories were new to me. The wonder of the project and the Humans of New York: Stories book is that it offers such a unique peek into everyday lives, for better or worse, a glimpse of what single event impacted someone or what was dominating their thoughts at that moment in time. And, sometimes they're just cute, whether quotes for kids or pictures of them with little or no commentary. 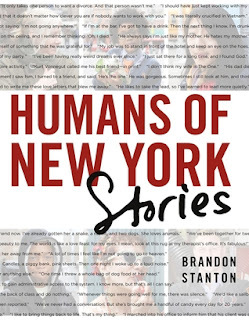 I asked my youngest son if he's familiar with Humans of New York, as I was reading, and he said yes, that he enjoyed it but he liked some of the stories better than others. He referred to a series of 4 photos that had just been posted, about a man whose wife was manipulative enough to fake abuse so that she could get access to free legal counseling and custody of the children when they divorced. The story ended happily; the truth eventually came out and he's now traveling the world when he has time off. But, there's no doubt that some of those stories are deeply unsettling, whether as examples of how people fall through the cracks or of how mental illness and abuse quietly destroy people. I do love the inspiring stories the best. But, I think it's the stories of people who have challenges that break them which make the Humans of New York project so special. Everyone knows how easy it is to justify not giving a homeless person money or food, how simple it is to avert your gaze and pretend they don't exist. Reading their stories reminds you that they're human, too. They're not necessarily even uneducated or drug addicts, as most of us presume. Some have ended up on the street because some random domino effect caused their economic lives to come crashing down around them and there was nowhere to turn. Those are the stories we need to talk about, to ask ourselves what we can and must do to make changes to keep people from ending up alone and without a place to sleep. Highly recommended - Great photos, fascinating stories. As a side note, since it just happens to be November and National Novel Writing Month is in progress, it occurred to me that Humans of New York: Stories might be an excellent story starters for writers. The stories are brief enough that it's easy to read a story and think, "I could expand on this, fictionalize it, make a novel or short story out of it." All of this week's arrivals were purchased by moi. I definitely need to read faster. The Dust that Falls from Dreams by Louis de Bernières - Totally fell in love with this book, a story of love, war, and friendship. Yesterday was the first day I've taken off from writing since NaNoWriMo began. I'm a terrible sleeper and was feeling the effects of a rough night, so I decided to just pay bills, do a little housework, and take a nap. Fortunately, today I met my goal for the day. Oh, hmm, I guess that's about it. Hopefully, I'll get around to watching the second episode of Sherlock, tonight, so I can move on to reading about the third one in Sherlock Chronicles. I love that book. Seriously, if you're a Sherlock fan, you must track down a copy. Since I'm done writing, I'm off to read a bit. Maybe hang out with my little fur sweethearts. If you click on the photo to enlarge (or have better eyes than I do), you'll see that Izzy's almost-matchmate is the cover star of a 2012 calendar. Yes, I keep a 2012 calendar on my desk to remind me of one of the best vacations of my life. I tried to find another Japanese calendar for 2013, but never did find anything that pleased me. So, I just leave the old calendar in place. First things first: Illuminae is gorgeous. When the two copies I pre-ordered arrived (one for my son, one for myself -- an error, but one I opted to let stand), I was immensely impressed by the gorgeous slipcover, which is semi-transparent plastic. The hard paper cover beneath is even impressive -- black, red and yellow on a white background. A lot of money has gone into the production of this book, that much is clear. Illuminae is a YA sci-fi that begins with the attack of an illegal mining colony by a competing corporation. It's the 26th century and there are ships that can create their own wormholes. The attack is unexpected and devastating. Of the three ships on which survivors manage to escape, only one is able to create wormholes and unfortunately that's impossible due to damage to the ship. The survivors need to get to a static wormhole to escape the pursuing ship and travel back to civilization but it will take months . . . and there are two things chasing them: a terrifying disease and an enemy ship. On top of those problems, there is a computer much like Hal of 2001. It has gone rogue and may be as deadly as the enemy. My son and I read Illuminae together, thanks to the fact that we had two copies. He read and enjoyed Jay Kristoff's previous series and Illuminae (written with co-author Amie Kaufman) sounded like my kind of adventure, so we were both pretty excited. We have read books together -- or taken turns reading -- and then discussed, off and on, for years. I highly recommend doing so with kids, if you have them. Reading together is a great way to ramp up your child's excitement about books when they're younger and I've found one of the most enjoyable things about having older children is that now, even when we're far apart, we often end up discussing what we've read over the phone. Back to the book . . . Illuminae is written as a dossier collecting various documents, ship-to-ship communications, diagrams, diary entries, etc., relevant to the attack and the events that followed. It has a lot of illustrated pages -- some with only a few sentences written in stylized waves, some cutaway views of ship interiors, some simply with centered text in a robotic font. So, in spite of its 599 pages, the book is a quick, light read. It's also very plot-centric and fast-paced. My son and I both loved the amount of action and the pacing. The only thing we disliked was the romance. Kady and Ezra are the main characters, a young couple who had just broken up before the attack. They survive the attack together but are separated. Much of the communication is between the two of them when they reconnect. Both of us found the romance sappy and hard to buy into. But, we liked the story so much that we were both willing to overlook our slight discomfort with that particular aspect of the book. Highly recommended - A wild ride, immensely entertaining, with a unique presentation. The Illuminae Group is the shadowy group that has gathered the information into dossier form and Illuminae is the first in The Illuminae Files series. "At a signal from his guardian angel, _____ is out the door like his ____ is on fire." I don't recall what I thought at the time, but it was probably something on the order of, "At a signal from his guardian angel, Twinkletoes is out the door like his hair is on fire." Trying to creatively substitute non-profane words simply added to the fun. Important addendum: I neglected to mention that the book works as a stand-alone. This is rather crucial information. I absolutely abhor cliffhanger endings and will generally refuse to continue a series if an author doesn't wrap things up. Illuminae was nicely wrapped up, enough so that I found myself wondering what on earth the authors will come up with, next, because clearly it will not be about the same incident (although I do wonder if at least one of the characters will be involved). Sloth Slept On is the story of three children who discover a sloth sleeping in a tree. They try to ask it what its name is and what it's doing in their tree but, of course, there is no reply. The children decide they must find the answers on their own and haul the sloth with them. First, they try asking their father about the sloth but he's busy, so they gather books about animals and search through them. Meanwhile, the sloth is sleeping on their floor while someone behind the children is reading a newspaper with the headline, "Zoo breakout! Zookeeper looks high and low for missing animal." Of course, there's a photo of a sloth. Nobody notices, and the adult reading the newspaper is, again, ignoring the children. The children discuss what kind of animal the sloth is not. They wonder where he came from and dress up as astronauts, imagining that he came from space. They play at being pirates while they think about the possibility that the sloth is a pirate, tired from his adventures. They even wonder if perhaps he was a knight who wore himself out fighting dragons. Then, one of the children finds a sloth in a book about the rainforest. A two-page spread of factoids about sloths follows. Now that they know sloths live in the rainforest, the children decide they must send him back. They prepare a box with leaves to eat and toys to play with, pack him in the box, and mail him, totally overlooking the signs around town asking people to return the sloth to the zoo if they find him. The sloth awakens to find himself in the rainforest, a postal truck driving away, and he asks, "Which way to the zoo?" 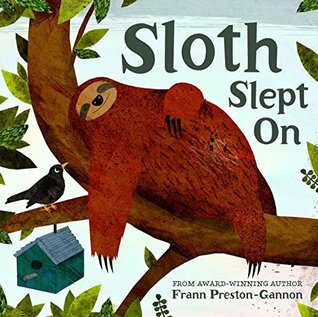 I absolutely love Frann Preston-Gannon's illustrations and adored the other two books I've read by her but Sloth Slept On was a little discomfiting. First, the children are ignored by both adults present. They can read but they miss clues about the sloth that are in plain view. And, then they send the poor guy to a place far from where he belongs. I love the creativity of the children as they imagine the possibilities about what wore out this strange creature. But the idea of that poor sloth getting mailed far away where nobody will find him . . . well, maybe it's an adult problem. As adults, we know that a zoo animal that has been fed and cared for would probably not survive in the wild, so it just made me squirm. I do love the illustrations, though, and I don't dislike Sloth Slept On. It's just not a particular favorite. I waited till nightfall to start typing my Monday Malarkey just in case more books decided to launch themselves through my door, but no other books have arrived in the past two weeks. 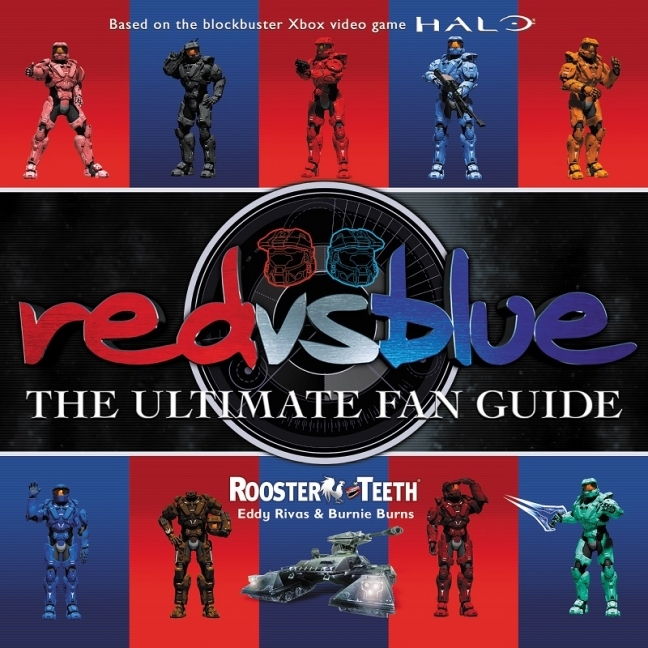 So Red vs. Blue: The Ultimate Fan Guide gets to sit up at the top saying, "Look at me, look at me!" 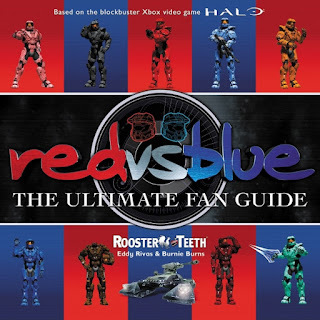 I do have some purchased books on the way, but Red vs. Blue is the only book that's arrived in the last two weeks. It's a review book from Dey Street (a HarperCollins imprint) and I got it to try to talk my son into writing a review -- he's a fan. I'm not having much luck, so far, but I think the series is pretty funny, even though I don't entirely follow it, so I'll read, view, and review if I can't talk Kiddo into doing so. I snagged the image of the book from that HarperCollins site, incidentally. I must have been in a hurry when I snapped a photo of my copy; it was terrible. I thought it would be best not to share. Just over 20,000 words! I'm kind of surprised that I'm still technically ahead. Although I deliberately went with a story that doesn't require a lot of research, it's not an easy story to tell because it's a genre that I kind of pick at around the edges: fantasy. I only like very light fantasy, e.g. Franny Billingsley or Gail Carson Levine (as opposed to the 800-page whoppers my son reads) so I'm attempting to write in a similar style. As in all National Novel Writing Month experiences I've had, there have been good days and bad. Since my attempt to write every day in 2015 came to an abrupt halt pretty early in the year, part of my goal in joining NaNo is to ramp the motivation back up. It's working; I'm enjoying myself and reconsidering how to structure my days so that writing time continues to be naturally built in when NaNo is over. I haven't finished anything since Well Wished by Franny Billingsley, early last week. That's okay. Last month started out equally slowly and ended up with a bang. I'm enjoying my reading. I've returned to The Dust that Falls from Dreams by Louis de Bernières, the chunkster I opted not to take with me on vacation. I had to restart it because I took too long getting back to it but I've been every bit as immersed as I was when I mournfully left it behind, over a month ago. The other book I'm reading is Sherlock Chronicles by Steve Tribe, one of my most exciting recent arrivals because I adore Sherlock. It is even better than I hoped it would be. After reading the introductory information and the chapter about the first episode, "A Study in Pink," we watched the episode. I have to tell you right now that if you're a Sherlock fan, Sherlock Chronicles is a must-read. I was stunned at how much perspective the background information added to the viewing of an episode of Sherlock I'd already seen several times. Cat update: Wherever I go, there they are. And, let me tell you, cats love it when you sit around typing for hours at a time -- at least, until they start craving a good laser chase or want Mom to roll a jingle ball. Fortunately, I need exercise just as much as they do, so we occasionally take breaks together. This photo totally cracks me up. Isabel was comfortably resting on the back of a sofa cushion, all droopy and relaxed until the nitwit with the camera came along and disturbed her. But, she was too tired to do anything beyond opening her eyes and rolling her ears back. My second favorite photo makesa it look like she's sinking into some sort of home furnishing quicksand. Can't you just picture a little thought bubble with the word "HELP" over her head? Oh, dear, someone has been a bad blogger. No Monday Malarkey, no Tuesday Twaddle. Not blogging this week wasn't deliberate. I usually feel like chattering at the end of a day of writing, whether we're talking National Novel Writing Month or any regular day that involves the writing of fiction. But, this week . . . nope, just didn't happen. That was partly due to the shift from sunny and dry to stormy (migraine weather) but I also just happen to have felt like I'd done all the writing I could stand by the end of the day. Some days, I have continued to write till as late as 9:00 PM -- which makes me sound more productive than I have been. It's been slow going. I'm at just over 13,000 words, technically ahead of the curve but the writing has occasionally felt like pulling teeth. Some years are like that. I've read quite a few books since I became a blogging slacker. I could have sworn I'd written about some of these at the blog, but I just flipped back to the main page and, nope, I must be thinking of the reviews I whipped out at Goodreads. In brief: I loved them all. More to come.